We have closed registration, but walk-ins are welcome! Please feel free to make a donation by clicking the "Register" link above. Established in 2012, LEO is a collaborative research center where social service providers and academic researchers work together to design, implement, and evaluate domestic anti-poverty programs. The Lab’s primary partner is Catholic Charities, the largest private provider of services to the poor in the U.S. The goal of this partnership is to apply rigorous research methods to build scalable programs and policies that help permanently lift people out of poverty. 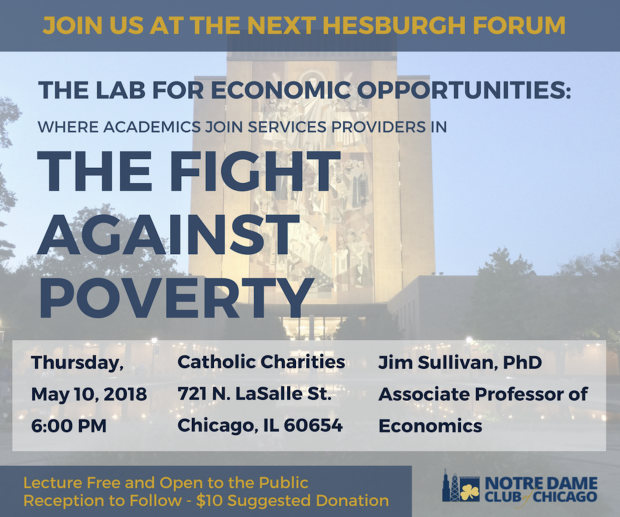 The Lab also provides an opportunity for Notre Dame undergraduates to be involved in anti-poverty research under the direction of leading poverty scholars. Jim Sullivan is the Rev. Thomas J. McDonagh, C.S.C., Associate Professor of Economics at Notre Dame, and a research affiliate of the National Poverty Center. His research examines the consumption, saving, and borrowing behavior of the poor in the U.S.; the impact of welfare and tax policy; and poverty measurement. In 2012, Sullivan co-founded the Lab for Economic Opportunities, a research center that partners with Catholic Charities and other service providers to evaluate program impact and identify effective and replicable solutions to reduce poverty in America. He received his B.A. from Notre Dame and his Ph.D. from Northwestern University.